- Fixed a vanilla audio bug by applying quiet sounds to suppressed Deliverer when used by companion/NPC. Now requires an .esp plugin due to the Lever Action and future planned sounds necessitating certain keyword changes to work properly. Please read the mod description before installing/using the mod! 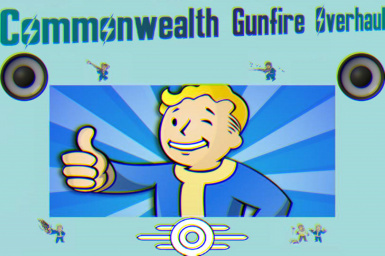 This mod replaces gunshot sounds for the player and/or NPCs with completely new and hand-crafted sounds compiled from various open sources (including vanilla sounds) that have been individually edited and mixed in Audacity by myself. but many full-auto weapons WILL NOT be using the new sounds. v1.7 - now includes ALL full-auto weapons in the game! Don't forget to endorse the mod if you liked it! Q: Does it change any reload/explosion/bullet flyby sounds? Q: I have tried many other mods that claim to change the NPC sounds, but they don't seem to work. Who's to say this one does? Q: Any weapons that you haven't covered and/or are planning to cover next? But, I really don't think these sound too bad in vanilla so I probably won't touch them. Also, they're not very popular weapons to begin with. A: In vanilla, most weapons have separate sound descriptors assigned to semi-auto and full-auto versions of them. The majority of this mod's audio files are semi-auto files, and by installing BAWS, it allows for my sounds to apply to full-auto weapons as well. Q: What other requirements does this mod have? And why does it include an .esp plugin? A: The mod requires both Far Harbor and Nuka World DLC by default. I uploaded optional DLC-free plugins in the misc. files section. It has an .esp plugin because it is necessary to make several new sounds to work properly. Also, this mod includes quite a few vanilla audio bug fixes. Q: What vanilla audio bug fixes? Q: Why does the automatic pipe and automatic combat rifle sound the same when suppressed? A: It's because I had to assign both weapons the same Sound Descriptor that I created from scratch. Otherwise, the combat rifle's sound just simply wouldn't change. Also it was required for several suppressed NPC weapons to have new sounds. There are still differences in the reverb parameters and rate of fire, so the similarities shouldn't be too noticeable. Q: Why do several weapons share the same NPC sounds? Q: Can you convert the plugins to .esl? A: All plugins are flagged as .esl in xEdit so they won't take up a slot in your 254 plugin limit. So, no I won't convert them. Q: Is this mod compatible with the mod X? For use in combination with other sound mods, you could individually select which audio files to overwrite. Q: Do you have any sound mod suggestions that I can use in combination with your mod? Q: If I give suggestions/improvements about your sounds, will you read and consider them in your next update? Q: Will this mod ever come to consoles? I do not support Bethesda.net uploads. Do not upload my mod anywhere else without my permission. 저는 Bethesda.net 를 지지하지 않습니다. 허락없이 외부 사이트에 절대로 업로드 하지 마십시오. Yo no apoyo a Bethesda.net. No subas mi mod en ningún otro lugar sin mi permiso. Я не поддерживаю Bethesda.net. Не загружать мой мод где-либо еще без моего разрешения.